Bacharach’s CARF-Accredited comprehensive inpatient rehabilitation program (sometimes called “acute” medical rehabilitation) is the most intensive, most comprehensive rehabilitation available. It consists of three hours of individualized interdisciplinary therapy five days per week under the guidance of a physiatrist-designed plan of care. Comprehensive inpatient rehabilitation is the most intensive therapy program available. Provided by an interdisciplinary team, treatment includes physical therapy, occupational therapy, rehabilitation nursing, case management and often speech and language therapy. Comprehensive inpatient rehabilitation provides 3 hours of interdisciplinary therapy each day, according to a care plan directed by a doctor of physical medicine. People who have had a stroke, brain injury, spinal cord injury, amputation, and some other neurological and orthopedic conditions make the greatest gains and have the best outcomes after a comprehensive inpatient rehabilitation stay. Rehabilitation nursing is an important component of comprehensive inpatient rehabilitation. Certified rehabilitation registered nurses, CRRNs, reinforce the skills learned in therapy sessions and provide 24 hour nursing care. Along with the doctor of physical medicine, psychologist, dietitian and case manager, rehabilitation nurses round out the team of clinicians dedicated to the care of each patient. The therapy team meets weekly to discuss goals and progress as well as family education and discharge planning. CARF is the Commission on Accreditation of Rehabilitation Facilities. CARF is the body that recognizes and guarantees quality rehabilitation care. 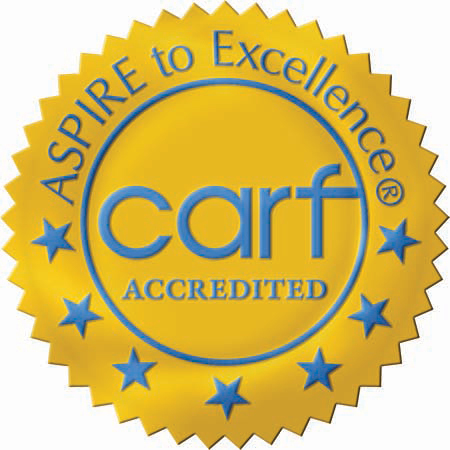 CARF conducts a survey every three years to make sure that organizations are meeting the rigorous requirements that entitle them to accreditation. Bacharach has eleven accreditations for its comprehensive interdisciplinary rehabilitation programs.